This level has medium difficulty. 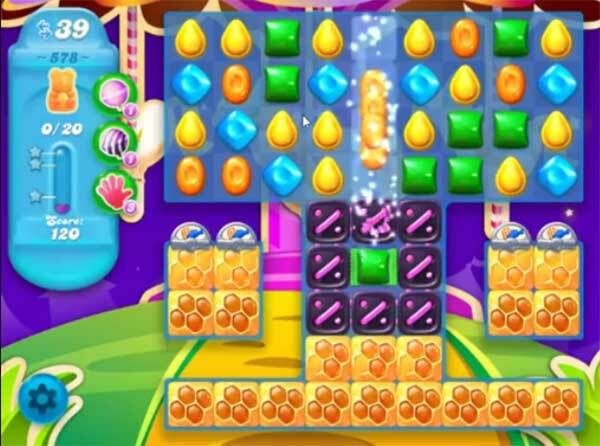 For this level try to play from the top of the board and make striped candy. Combine striped candy with colorbomb or wrapped candy to break the honey that are in bottom to save the bears. If any one every considered quitting Candy Crusher this is the level to do it on. I do not understand why the management or programmers thinks any one would enjoy playing the same game over hundreds of times! Anyone know why my level 578 starts with only 35 moves? I only have 35 moves. I can’t get past 17/20 bears. Those extra 5 moves would probably make it easier. I’ve been on this level for days!!! Why is it so hard to break the honeycombs. It takes several hits to get to bears. No matter how many special candies, bombs etc. I can’t get all of the bears! Is there a way to skip levels? I’m really sick of this stupid impossible level. BTW there are 35 moves not 40. Regardless of how many special characters created the honeycomb takes so many hits they use up all the moves. Hating this level!!!! Who wants to play when you can’t win after hundreds of tries? ?